Ross Wilson, the Stewardship Director for the Metlakatla Nation on BC’s North Coast and Johanna Helbig, Projects Coordinator for Coastal First Nations-Great Bear Initiative (CFN) attended SVI Vancouver last year. Metlakatla is one of two communities involved in CFN’s Regional Non-Timber Forest Products Conifer Oil Project, along with the Nuxalk Development Corporation who also had a representative at SVI Vancouver. 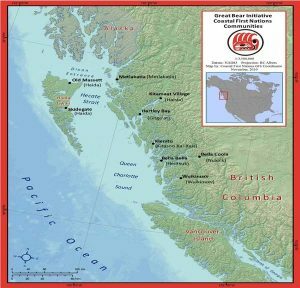 Coastal First Nations is an alliance of First Nations on British Columbia’s North and Central Coast and Haida Gwaii engaged in stewardship, capacity building and the creation of a conservation economy in the Great Bear Rainforest region. The First Nations within this alliance see their rare and unique Great Bear RainforestTM essential oils as a way to create further value for their Nations, while valuing their forests as a valuable resource. The business is a social enterprise which employs First Nation’s band members at every level of production. Production begins with the collection of salvaged boughs (a byproduct of logging or pruning in the area) from shore pine to sitka spruce, all wild-harvested from the forest and then steam-distilled into pure essential oils for purchase by anyone from aromatherapists to makers of bodycare products. One of the primary goals of this enterprise has been to provide “consistent, long term, meaningful jobs” to members of participating Nations, says Johanna. When I spoke with Ross, he said, “To me that’s where I think social enterprises can take it to the next step… creating opportunities.” He says the community is really excited about this business and the potential it holds. The feedback has been overwhelmingly positive. The employees feel good about the work and the stewardship of their traditional lands in this way. Helbig says, “they just love doing it”. One production manager said people who have found it hard to find work (particularly young folks in the community) find this work meaningful and rewarding. Ross also mentioned the importance of stewardship and conservation as driving forces in business planning. There is a deep commitment to stewardship and a key tenet of the initiative is to build “a conservation economy where people, communities & land are inseparable”. At present the business is focused on engaging new buyers and expanding their marketing efforts. Johanna says the connections they made at last year’s SVI Vancouver were really valuable and they have already begun working with a fellow participant on their marketing strategy as they move the project forward. You can read more about this and other projects on the Coastal First Nations website. Social Venture Institute Vancouver takes place April 19th – 20th, 2017 an early bird discount of 15% off is being offered until January 31st. Find out more or register today at SVI Vancouver!